How To Make The Perfect Bed! The Daily Nest: How To Make The Perfect Bed! How To Make The Perfect Bed! When you think about making a bed you might think, "Who doesn't know how to make a bed?" Now I admit I don't make my bed everyday. I'll go in spurts of making it. And sometimes I have to conscientiously think about making it. Whew! I feel so much better getting that off my chest! Making my bed starts my day off feeling like everything is organized and right with the world. My husband is a freak about the bed! Let me reword that! You see he has to have the sheets and blanket a certain way. The sheet can't be longer than the blanket and at night he pulls it down so it looks like a hotel...like I said "Freak!" I could sleep in it any ole way or how! So I started thinking about what makes for the perfect bed and started doing some research on the art of making a bed! This is what I found from Martha Stewart, who is the Queen of Homemaking! First you need to start with good quality materials. Don't skimp or cheap out on bedding! I mean after all you spend a third of your life there! Begin with a good-quality mattress and box spring. Protect the mattress with a cotton cover; Martha adds a wool pad. 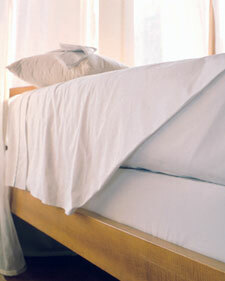 Give your linens a spritz of linen spray, when making the bed up or after pulling your bed down at night. 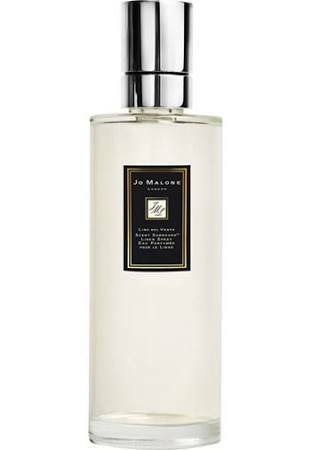 This spray by Jo Malone is a beautiful soft scent. Pour 3oz. of alcohol in a bowl. Add 30 drops of an essential oil of your choice and mix thoroughly. Add 1 1/2 Cups of distilled water and stir together. Use a funnel and pour into a plastic spray bottle.